I will admit--I expected Quebec City to be a mini Paris. Instead it was an interesting mix of Canadian and French culture with a bit of its own flair. For those of you who have never been or are visiting again soon, let me describe for you everything it is and is not. It is a historical, walled city and much of the original wall is intact. In fact not only can you explore inside the walls, but on top of them! There are stairs in multiple places that allow on onto the very wide walls. With a pathway you can walk from the western tip of the Citadelle to Porte Saint-Jean and the grassy areas are ideal for a picnic or laying in the sun. This was one of our favorite places to be in the evening, relaxing before or after dinner. However, there is much to see outside the walls also, where it is less touristy and more authentic. Walk down Rue Saint-Jean or Grande Allée to experience a little bit of local life, the Plains of Abraham and Garden of Saint Joan of Arc are also great places to relax in the many green spaces of this city. It is not a bilingual city. 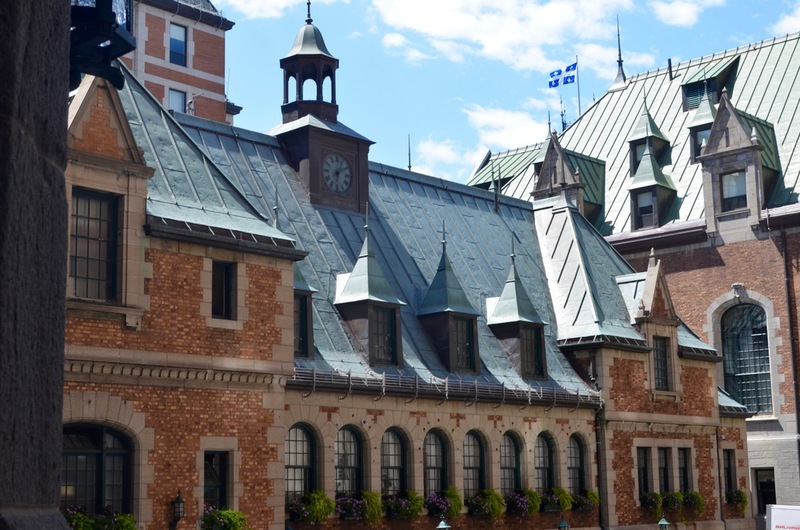 You will quickly find when visiting Quebec City that some people do not speak English (I have a hunch that many of them are simply pretending) or flat-out refuse to. However many of the staff in shops or the tourist industry can speak French and English. So my advice is to know a handful of French phrases, and use French greetings. But like the French, the Québécois do not love those who are not fluent to speak (read: degrade) their language, so basically there's no way to win. However, the people are not unfriendly and can be quite warm. We ran into a parking attendant who had the keys to our apartment and was simply not going to hand them over until we explained ourselves fully. But with my French, we managed not only to secure the keys, but to make a bit of a friend. It is an English commonwealth, meaning that the Queen of England is actually the Head of State. This is because James Wolfe and English troops defeated the French Montcalm in 1759. Yet Canada is it’s own country with a separate legislation. I'll let you know a secret: the Queen visited Canada last in 2010 so you can guess how involved she is. Speaking of defense and war, if you are in Quebec City you will probably check out the Citadelle. As it is still an active base, you will need a guided tour to get inside, but our tour guide was hilarious and full of cool information. It is full of delicious cuisine. Around every corner is a great bakery. Some of our favorites included Paillard for the noeud savoyard or any of the croissants, Paingrüel for the viennoise, Cantook for specialty pour-over coffee, La Maison Smith for the macarons, or Panetier Baluchon which has excellent meringue. For ready-made food for a picnic or just to go, go to Fou du Bio, an organic market in the Lower Town that has homemade artisan chocolate (the owners father and grandfather were chocolatiers in France), or La Carotte Joyeuse, outside the walls. It is not only a capital of French food, having many other delicious international cuisines. If you want to go on a bit of an adventure towards the metropolitan part of the city, eat at Bashir, an authentic Lebanese restaurant. We ordered the plates with many sides and salads. You can pick your protein--the vegetarian in me recommends the falafel. When it arrives there will be hot, fresh naan bread on top that you can scope the variety of flavor into. Amazing and affordable too! Another good place to eat dinner was Sapristi, an Italian bar and restaurant with awesome flatbreads that will not break the bank. But set a reservation ahead of time if you want outdoor seating. Quebec City is right on the St. Lawrence river which means beautiful views either from the walkway by The Chateau Frontenac (beware it includes a very long boardwalk with many stairs) or down below in the Lower Town. You can take the funicular or cable car for a few dollars to quickly ascend from one to the other. It also means that visitors are very close to la Chute-Montmorency, a beautiful waterfall that is slightly taller than Niagara Falls, and l’Île d’Orléans, an island filled with farms. I recommend that you take a day trip out to see both--we ziplined over the falls and got sprayed with the mist before picking up delicious locally grown food at the island (stop by Mona Cassis & Filles). Basically, if you visit Quebec City, be sure to take advantage of the beautiful scenery.